Fake news used to be easy to spot. Who doesn’t remember those tabloid headlines that screamed “Elvis is Alive” or “I was Bigfoot’s Love Slave!”? These days it’s a little trickier to discern fact from fiction. It doesn’t help that up to ¾ of us are getting at least some of our news from social media, where fake news runs rampant. People like sharing stories that make them laugh, make them mad, and confirm their biases. Many of us don’t stop to check a story is actually true before sharing it. So, how can you navigate the chaos? 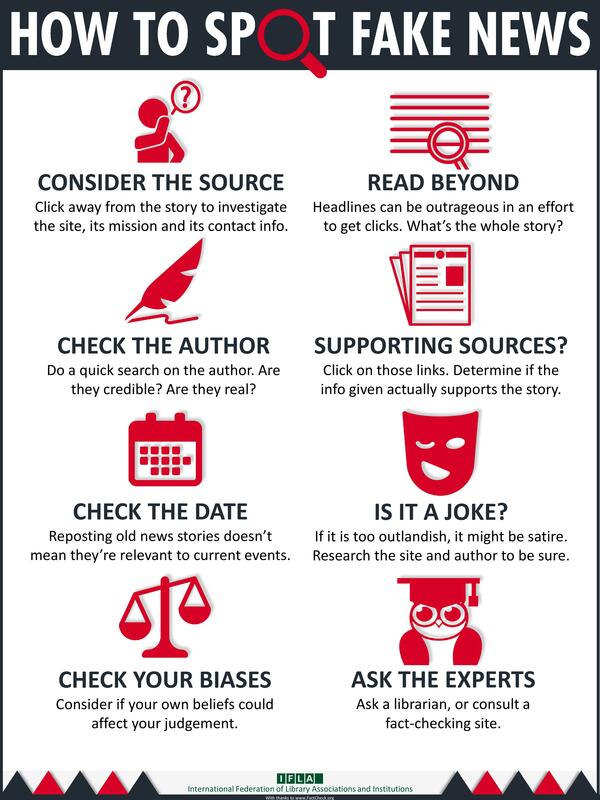 The International Federation of Library Associations and Institutions (IFLA) has developed this great resource to help you spot Fake News. We've outlined more details about how to stay savvy, below. View the original infographic in more languages here. Consider the source. Is the website reputable? A total lack of an About Us section, Contact Us section, or any other type of identifying information may mean that the website is not a legitimate source of information. Blogs (like this one!) often have great content, but you want to make sure the post is not just offering opinion and bias. Is the blog selling something? Is there an overt political agenda? Does the author back up their information with research? Check the author. Are they trustworthy? Are they real? Google the author to check their credentials. If a Google search comes up empty, you may want to research the story a bit more. Check the date. Is old news masquerading as breaking news? Reposting old stories doesn’t mean they’re relevant today. Take a closer look at the date an article was originally published (and always double check the article wasn’t published on April 1—the joke could be on you!). Check your biases. Is the story based on facts or opinions? Robust news sources give you both sides of the story. Do you just read articles that you agree with? Avoid the echo chamber effect, and seek out articles with different viewpoints. Learn to tell the difference when a story is giving you basic facts, and when a story editorializes on the facts to make an argument. It’s worth your time to find the original story before you make up your own mind. Few news sites are completely unbiased. Take a look at the Media Bias Chart to see if you agree with the placement of your favourite news source. Read beyond the headlines. Are they misleading in any way? Always read the entire article before you decide to share it on social media. Can you find other articles that verify or debunk the story? 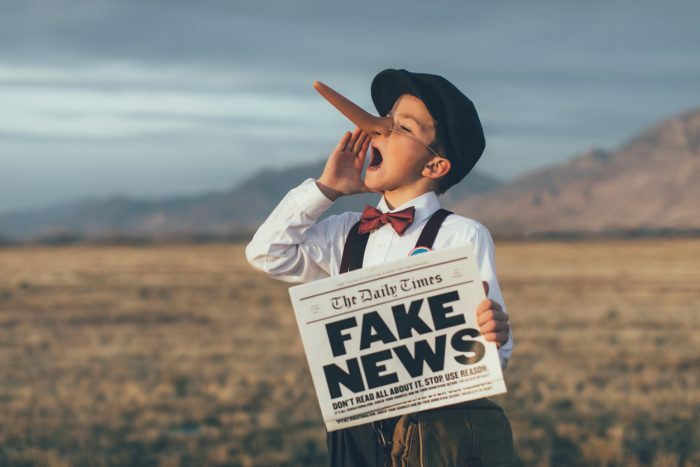 snopes.com is a great website that researches the background of well-known conspiracy and fake news stories. Find supporting sources. Is there research behind the story? Click on the hyperlinks in the article—do they take you to original, recent articles that measure up? Don’t forget that even Wikipedia articles include their lists of supporting sources at the bottom of the page. Click on these links to get the original story. Take a step back. Is it a joke? It’s hard to know what’s satire these days, especially when the real news sounds like something you’d see in The Onion. Look at the About page of the website. Does it clearly state it is a satire site? Can you verify the story on another site? Ask the experts. How can we help? That’s us, your friendly neighbourhood library staff! We’re proud to provide you with trustworthy online resources for news, scientific studies, and health information. Or, visit us at any branch and we can do some sleuthing together.